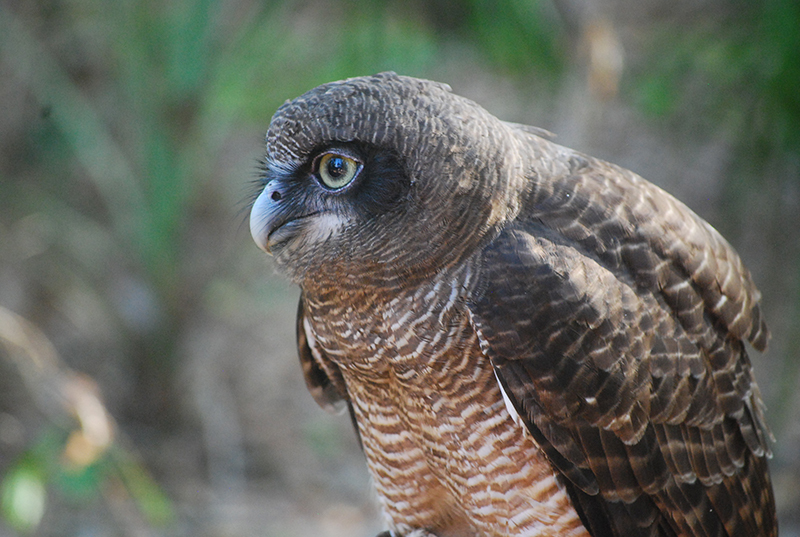 Rufous owls habitat is monsoon rainforests and they live in the wild for about fifteen years. Ruby is about fourteen and a half but, being in captivity, can expect to live longer than that. Each day she gets to stretch her wings around the flight deck, where handlers show the birds off to park visitors. Occasionally the birds fly off for an hour or two, enjoying a taste of freedom before returning home for a feed and a bit of attention. A couple of days ago, Ozzie the osprey decided to take advantage of a little bit of freedom – but he hasn’t come home. Apparently this has never happened before and the keepers are all rather worried about him. He’s a very popular bird – my son for one will be very upset to hear that he’s taken wing. Maybe he’s found a mate. Maybe he just decided it was time for an extended vacation and he’ll fly into the middle of a show on the flight deck and surprise everyone. Wherever he is, as long as he is all right, I guess it’s okay. 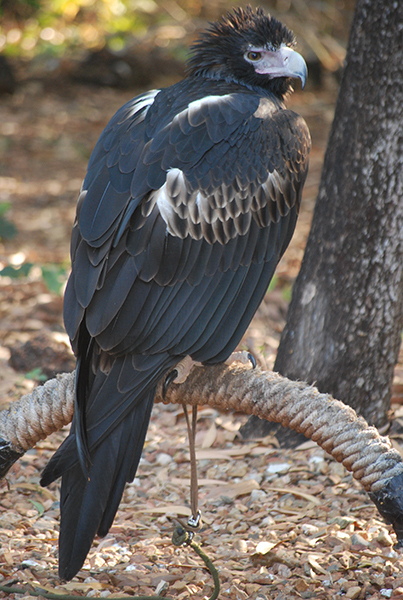 Last week, we met Yarak, a stunning wedge tail eagle. She was an excellent model, standing still for long periods of time while our pencils flew over the page. Yarak is a term meaning ‘keen to hunt’ used by hawk trainers. Yarak was a bit chilly, which is why she is wearing her pom pom look – as she warmed up the feathers on her head smoothed down. I’ve also spent time with little black flying foxes, watching them wake up, stretching and yawning and scratching. The branch one was hanging from fell down while I watched giving the poor little critter a nasty fright. It scampered across the unaccustomed ground and back up the tree as fast as it could go. Of all the bats and flying foxes these are my favourites with their cute little canine faces and bright eyes. They share an enclosure with sugar gliders, which are just about the cutest thing in the Australian bush, as well as the bush stone curlews with their enormous eyes and funny jerky movements. It’s my favourite display in the nocturnal house and I sat watching the activity for over an hour until I could hardly move from the cold, being unaccustomed to air conditioning. 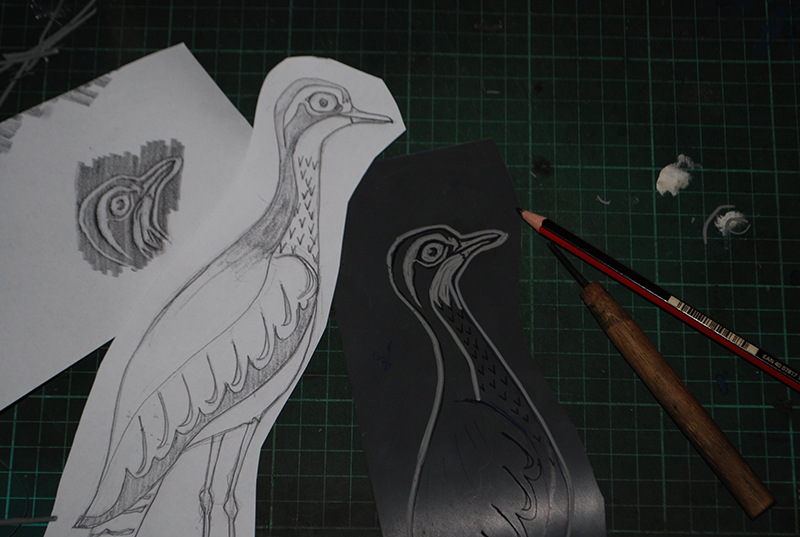 I’ve started working up designs based on these nocturnal birds and have been enjoying messing about with my lino cutting tools, which have been idle for some time. But for now, it’s time for me to get back to the sewing machine. The dry season markets have well and truly begun and there is much to do… especially with a solo exhibition coming up in a few months. More on that another time!